Its cinnamon colored sandstone rises like a lacework curtained veil into the cobalt sky above. From the ground all I see are miniature niches covered with hundreds of tiny windows. Behind its intricate architecture, this lavish latticework hides a mysterious world. 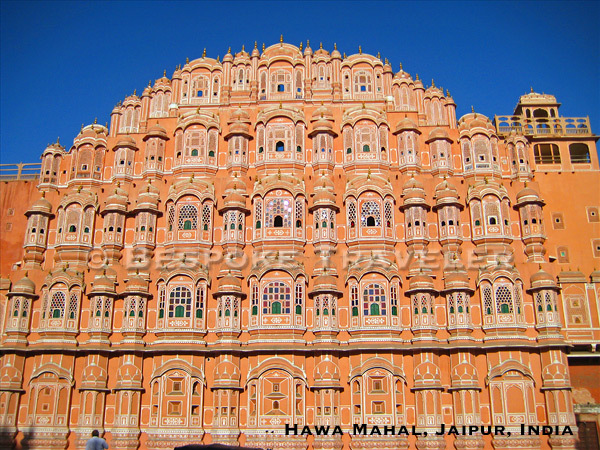 I’m in Jaipur, India, the “pink city of Rajasthan,” staring up at the incomparable Hawa Mahal. A strict translation of Hawa Mahal is Wind Palace, but this is no palace. It’s an exotic entrance way into the life of Rajasthan’s royal ladies, and I am about to go behind the wall to see what Jaipur looked like from the other side of the multitiered windows. Although this extraordinary structure is known as a palace, it is in reality a one room wide tower that rises fifty feet (fifteen meters). The fanciful enclosure was the only means by which the palace women could look out onto the ceremonies and parades being performed on the street. Because of a strict rule of purdah, a social custom whereby females could not appear in public, Hawa Mahal provided the perfect viewpoint for the royal queens and their household to participate in Jaipur’s busy city life. This area is still as hectic as it was in their time. The Wind Palace takes up most of the Johari Bazaar Road, a hectic main thoroughfare of the city, congested with cars, bicycles, motorcycles, and cows. The scent of spices and flower garlands from the nearby street markets mingles with taxi smog and the peculiar aroma of thousands of humans for a sensory assault on my nostrils. Meanwhile, my challenge is how to cross the frenetic Johari Bazaar Road in order to get inside the Hawa Mahal. Diligently as I look there are no entrances on the building’s street side. The front of the palace is forbidden to me by a black grated fence. Even if I vaulted over the fence, the doors I see are fastened by giant bars and locks. As I amble back and forth, trying not to get run over on the narrow sidewalk, an old man sitting calmly in his tightly wrapped sarong, shouts and gestures me over. He has been watching my antics to enter and, though we don’t speak the same language, gesticulates that I should try my attempts around the corner of the street. I follow his directions and once off the main street, immediately notice a sign pointing to Jaipur’s City Palace. Built in the early portion of the 1700s, the City Palace was the main residence of Jaipur’s ruling dynasty. Could this be the way to get inside the Hawa Mahal? Nothing ventured, nothing gained, I feel, so I head over to the City Palace. At best, it will be an appropriate place to get understandable directions to the Wind Palace. Turns out, according to the guard watching the entrance at City Palace, that my hunch to finding Hawa Mahal through the palace is correct. I can already see it in the way Hawa Mahal’s ochre and butter color combination are replicated throughout the City Palace’s other structures. So are the sensually curving arches I see everywhere. Inside the palace, elaborate gates reveal hundreds of inner courtyards that lead to various private chambers, audience halls, and galleries. Although the sounds of traffic and a bustling city are hushed inside the palace walls, this is not the serene compound I imagined it would be. Voices of fellow travelers and the sturdy footsteps of the palace guards fill the spaces here, and while I can’t smell the distinct aroma of one of India’s largest cities, there is no sweet garden fragrance to welcome me into this exotic society. I could easily get lost among this maze of buildings if it weren’t for the helpful guards posted at the entrances. In search of the elusive Hawa Mahal, I fly through elaborate arches covered in mosaic peacocks, embedded cut glass, and marble inlay decorations, each time finding a patient attendant who points the way further into the palatial network. Several turns, piazzas, and arched gateways later, I find myself in front of a long saffron colored wall with a double curved staircase leading to an elaborate domed beige portal. As I walk up the stained timeworn stairs, I envision the royal ladies of the eighteenth century in their veiled saris watching me from the dark windows above. The back side of Hawa Mahal is embellished with a fountained courtyard. On three sides of the enclosure stand the chambers of the harem, where the royal women would be housed separately from their male counterparts. The fourth is the famous cerise wall of the Hawa Mahal, the provocative barrier through which these women experienced the outside world. From this angle, the building looks simple, despite its scalloped vaults and latticed windows. Graduating ramps circle the Hawa Mahal, giving access to each floor. I make my way slowly from the first to the third floor, admiring the filigreed work and jewel colored inset glass decorating the tiny chambers. To call each of these cavities rooms would be wrong, rather they are simple alcoves, nicely decorated but without the sensuality that the Wind Palace’s facade exudes. The top three floors of the Hawa Mahal replicate the look of the building’s outside semi octagonal chambers. Up here I can finally feel the breeze waft through the layered windows. Down below the quad remains silent. On the other side of the barrier, the busy sounds of Jaipur’s marketplace filter through the sandstone latticework like a world from far away. On the balcony, surrounded by a group of colorfully dressed local tourist women, I get a glimpse of what the royal harem of Jaipur looked like assembled onto this platform. As they look down I watch their beautiful saris of daffodil, lavender, scarlet, and teal flutter in the soft wind. Their hands jangling with clusters of golden bangles, and their heads covered with the loose end of their draped outfits, the women laugh merrily and chatter excitedly with one another. I smile as I watch them and imagine this scene being repeated many centuries ago by the regal women of Jaipur’s court. This is how they would have encountered Jaipur inside their sheltered world, from behind the seductive exterior of Hawa Mahal. The sound of the women’s enjoyment carries down as I descend the Hawa Mahal and make my way out of the courtyard. When I eventually return to the busy bazaar road, I look up at the rounded, delicately ornamented ochre curtain. I have been through the looking glass and seen the world that Hawa Mahal hides behind its exquisite exterior: a world that feels as exotic as the resplendently carved nine hundred and fifty-three portholes the Wind Palace flaunts on its outside. When Maharaja Jai Singh II built Jaipur in 1727, it was the only capital of an empire to be constructed on a plan of gridded streets and subdivided urban sectors. From the position of entrance gates on the outside wall to the layout of merchant shops, every detail was supervised by the monarch and his close group of architects. Jai Singh II helped transform the architectural landscape of Rajasthan with his first arranged city and placed Jaipur among India’s most beautiful urban capitals. I loved travelling through the looking glass with you. So much would I love to do it in person. Thanks, restlessjo! It’s great to hear you say you enjoy my traveling stories. I hope you get a chance to travel to Jaipur at some point. The city is a magical place.